I needed a quick, very temperature + frequency stable oscillator @ 50.8 MHz to test a receive mixer. Already running elsewhere on my bench, my main VHF signal generator wasn't an option. VFO — difficult to stabilize at VHF. VCO — even more difficult to stabilize at VHF and it's too much work to make a PLL for it. 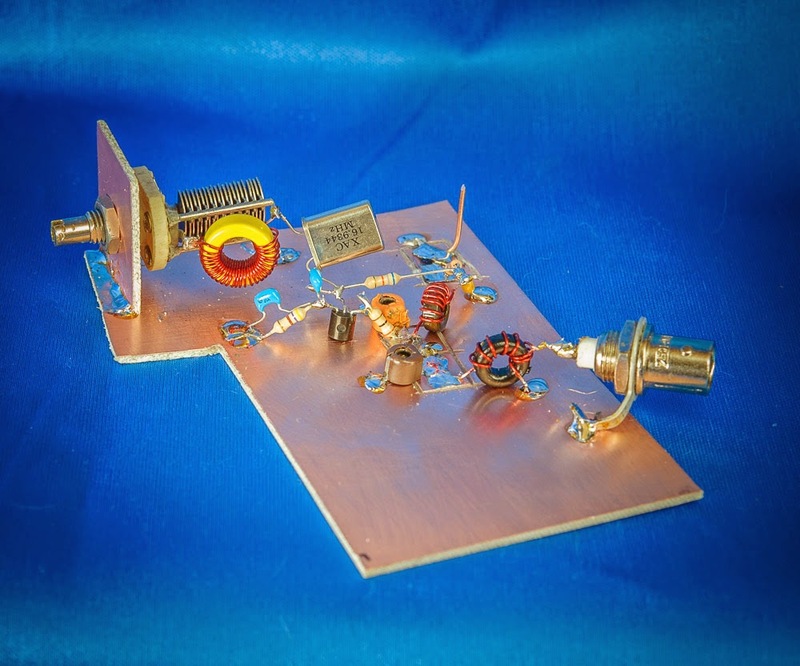 Overtone crystal oscillator — little chance of finding a crystal to vibrate at 50.8 MHz. Fixed crystal oscillator — need a crystal to vibrate at exactly 50.8 MHz. Right! VXO — do I own a 10.16, 16.93 , 25.4 MHz etc. crystal ? VXCO — still need a crystal to double, or take a harmonic from. The varactor will add phase noise, but might work. Then came a mad search. Soon enough, I found a long forgotten bag of crystals and after 10 minutes of fumbling with it, I felt jubilant to find a 16.9344 MHz crystal! Good, I'll make a VXO with an output filter to help suppress all but the 3rd harmonic. I grabbed a copper board and began soldering — no need for a schematic, for I've made many tens of xtal oscillators in my sleep. About 20 minutes later, I was done and ready to measure the ugly thing. At ~50 MHz, I foolishly went with single-sided Cu board and apart from a couple of carved squares, built with super-fast, classique Ugly Construction. The yellow toroid core = a T50-6, while the black parts are T37-10 powdered-iron cores. Low cost, low Q, garbage-grade trimmer caps employed. 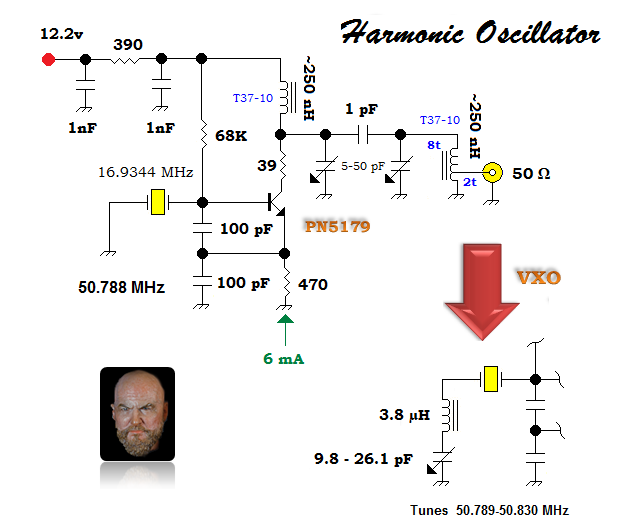 Above — A harmonic fixed xtal oscillator come VXO. First I ensured that the 16.9344 MHz was indeed a fundamental crystal by shorting the transistor's collector coil and measuring with a 10X probe ---- DSO with a built in frequency counter. 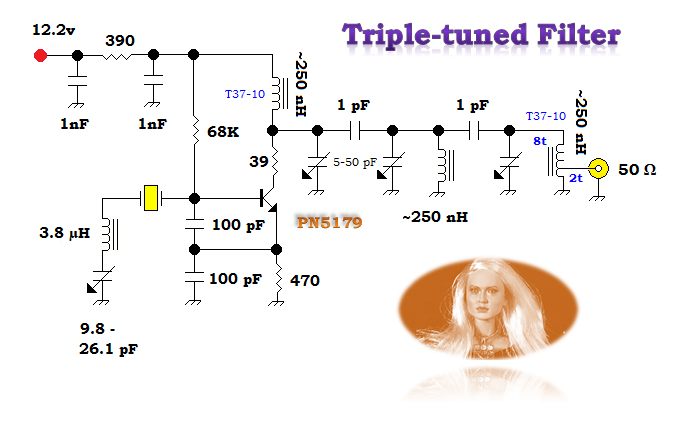 The doubled-tuned circuit values were chosen based upon my work with 6 Meter band-pass filters 2 years ago. As I recall, the 3 dB bandwidth is around 1.8 MHz for ~250 nH inductors, a tuning capacitance around 31 pF and a 1 pF coupling cap between the resonators. I build progressively: First made a fixed crystal oscillator and then after tuning up the output filter, measuring DC + AC voltages and current, I then added the VXO parts shown below the red arrow. The 3.8 µH inductor was just something lying in my #6 material toroid parts drawer. I keep several pre-wound inductors in each size hand to speed up design work. All I have to do is remove a few turns as needed, or go to a toroid that looks like it contains more wire. I don't count turns except when making transformers and instead rely on an LC meter to measure the inductance. 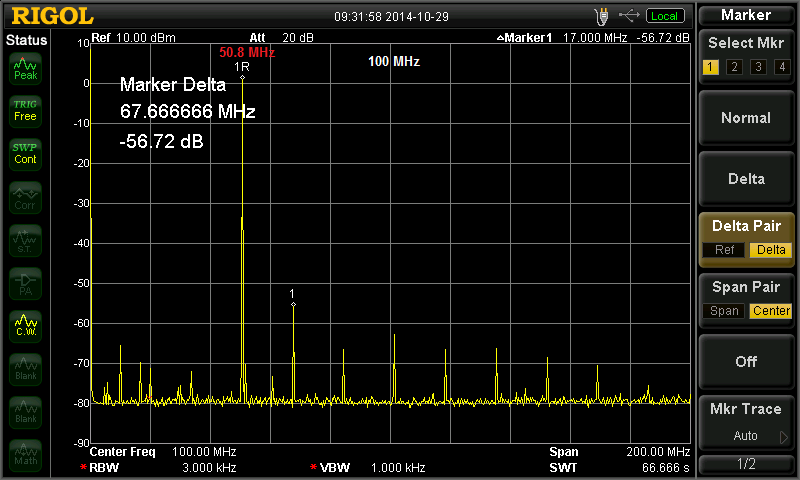 Above — Spectrum analysis after tuning the VXO for ~50.8 MHz. I red numbered the tones starting at the crystal's fundamental frequency. 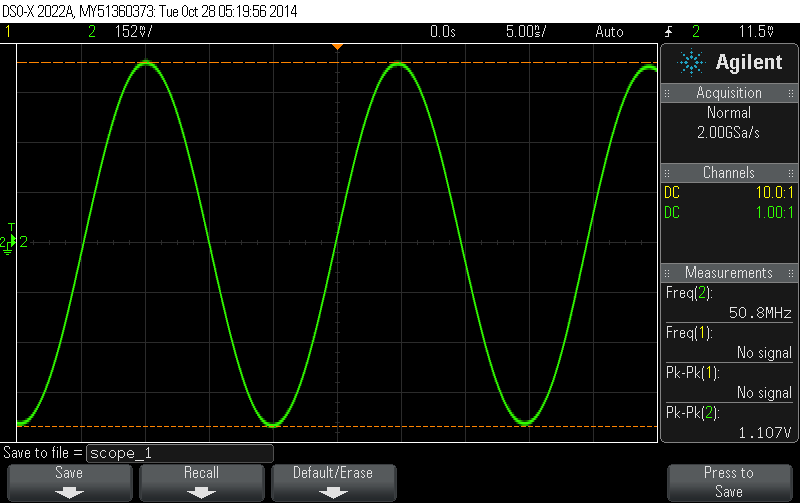 The strongest harmonic = the 4th tone @67.6 MHz lying -43.9 dBc. Above — the VXO output in time domain. Above — A triple tuned version. The double tuned version contained too much harmonic energy, so I added another identical tank and re-measured. Above — Spectrum analysis of the TT harmonic VXO. 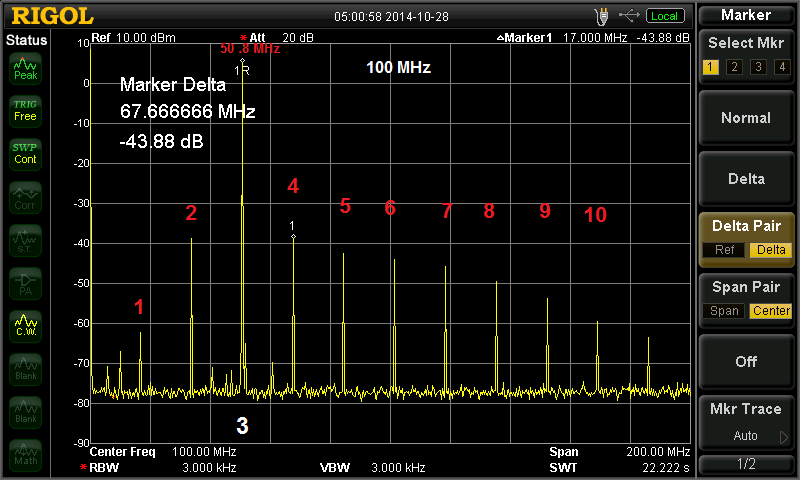 Strongest tone = -56.7 dBc; most are under 63 dB down.